SPAM is one of those items that everyone has heard of. 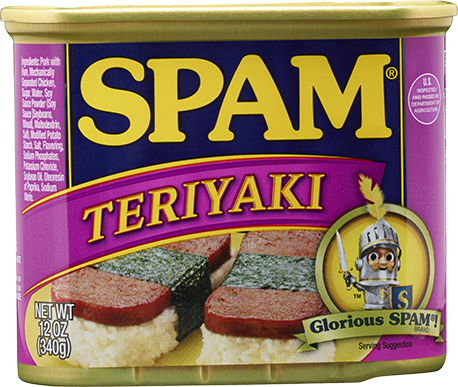 I know that there are many that have childhood memories of eating SPAM. Did you know that SPAM has been around for over 75 years? No wonder it is a brand that many are familiar with. Last year is when I first introduced my kids to SPAM. They both enjoyed it, I made it simple by cooking it up in the skillet and serving it with eggs and toast. With the newest flavor - Teriyaki, my mind went right to stir fry or burgers with pineapple. There is something that is so appealing to me about the flavors of Teriyaki and warm pineapple. A quick search of the recipe collection on Spam.com found me both! Noodlelicious SPAM Teriyaki and Hawaiian SPAMburger. With this introduction, the SPAM® family of products now offers 12 different varieties in the U.S., including recent additions of Chorizo and Jalapeño. I watched the video on SPAM Musubi and it does look pretty good too. Have you ever had SPAM? What's your favorite way to enjoy SPAM?